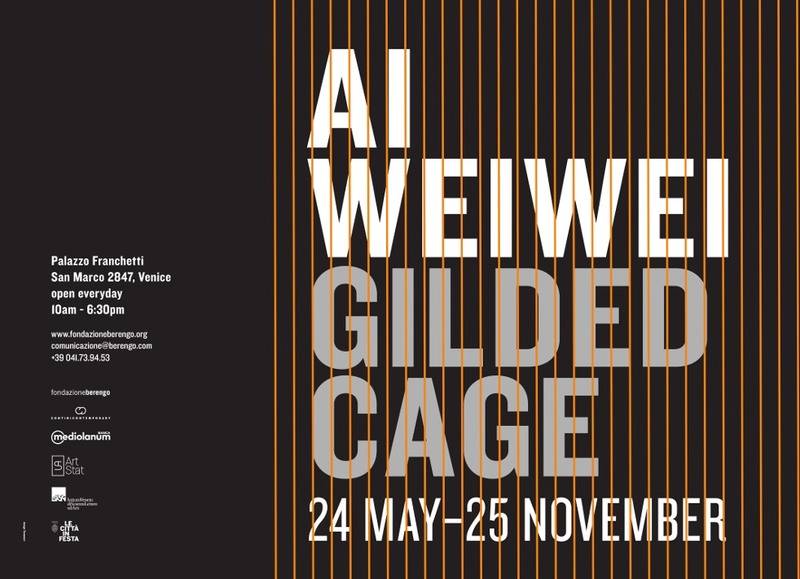 Fondazione Berengo was delighted to present the Gilded Cage by artist and activist Ai Weiwei in the garden of the historic Palazzo Franchetti. The Gilded Cage is one of the major works created by Ai Weiwei for the Public Art Fund acclaimed citywide, multi-media exhibition, “Good Fences Make Good Neighbors”, which was presented in New York from October 2017 through February 2018. The exhibition addresses the worldwide refugee crisis and current geopolitical landscape by using the theme of security fences as a powerful artistic symbol. In New York, the Gilded Cage was located at the southeast entrance to Central Park. Its gold color was a nod to the United States President whose tower is nearby. “The strongest of Mr. Ai’s new sculptures is “Gilded Cage”, standing 24 feet tall at the southeast entrance to Central Park. This elegant, quietly ominous pavilion consists of an inner ring, inaccessible to viewers, fenced off by hundreds of soaring arched steel struts. A small section of the inner ring has been cut out, so you can walk into the heart of this threatening pergola. Look up from inside, and Mr. Ai’s sculpture resolves into abstract beauty; look into the central ring, and you’ll see its symmetry disrupted by turnstiles familiar from the New York subway, or United States-Mexico border crossings. In many of Mr. Ai’s best sculptures, repeated forms are freighted with historical or political overtones and yet remain ice-cold. “Gilded Cage continues that idiom, even as it relies on prefab metal instead of found materials. As in the sculpture of Mona Hatoum or Rachel Whiteread, this excellent new work uses Minimalism to deliver a very un-Minimal emotional jolt. That extends to the monochrome paint job — a buff gold that echoes Augustus Saint-Gaudens’s nearby memorial of William Tecumseh Sherman, as well as the fastidiously polished brass in the atrium of the nearby Trump Tower”. New York Times, October 12, 2017. In Venice, the Gilded Cage stood on the Grand Canal in one of the city’s most beautiful gardens. Here, as in New York, visitors were able to experience first-hand the sculpture’s power by walking through the cage and its turnstiles. This exhibition of the Gilded Cage in Venice was the first step in an initiative which will use the common language of the arts to raise awareness of and educate the public about significant human rights issues, sponsored by Fondazione Berengo and the European Inter-University Centre for Human Rights and Democratisation.